How: leaves see below; berries as seasoning, infused, tinctured, or raw. 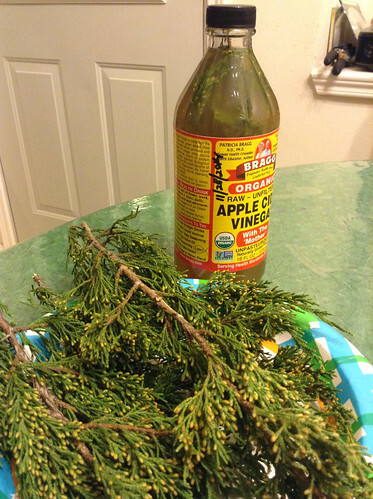 Dangers: do not ingest leaves or leaf products of Juniperus virginiana, which contain thujone. One of the trunks of Junipers ashei. Cedar berries which take several years to mature. Immature cedar berries. I don't use these. Infusing apple cider vinegar with cedar (J. ashei) leaf tips. 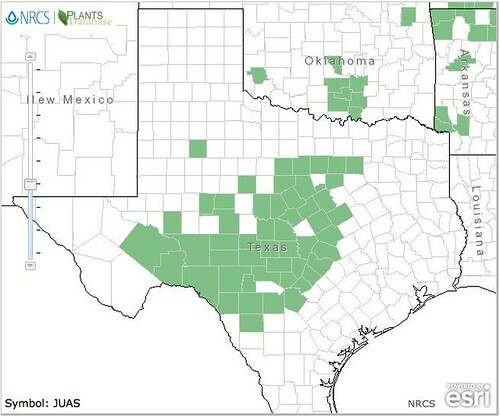 Texas distribution of Junipers ashei, attributed to U. S. Department of Agriculture. The marked counties are guidelines only. Plants may appear in other counties, especially if used in landscaping. 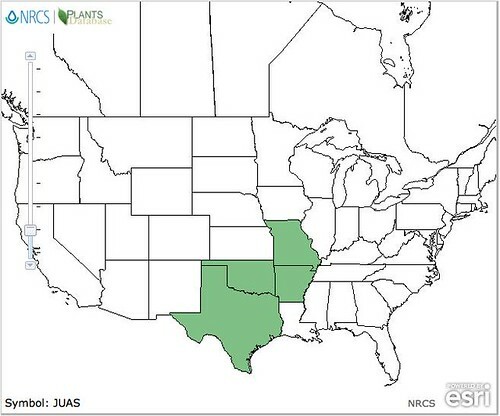 North American distribution of Junipers ashei, attributed to U. S. Department of Agriculture. 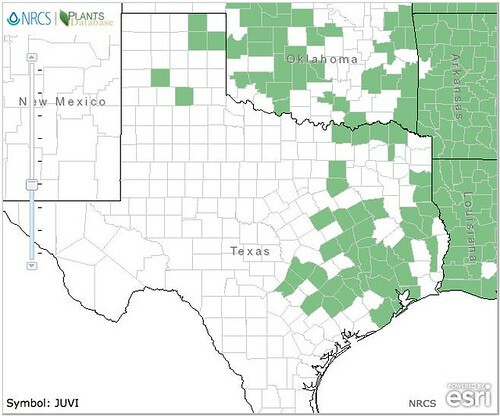 Texas distribution of Junipers virginiana, attributed to U. S. Department of Agriculture. The marked counties are guidelines only. Plants may appear in other counties, especially if used in landscaping. North American distribution of Junipers virginiana, attributed to U. S. Department of Agriculture. First things first, junipers and cedars are the same thing. That being said, there are two types of cedar trees in Texas. 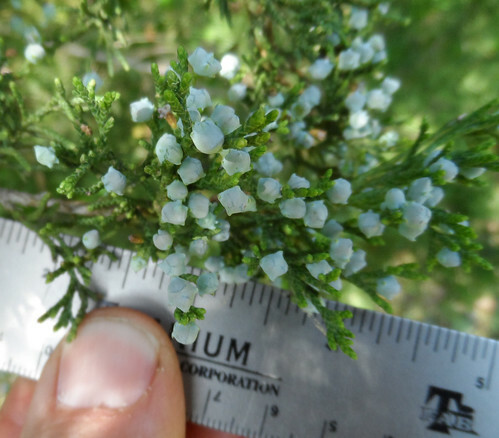 The first, Junipers ashei, is the small, multi-trunked Hill Country cedar sometimes referred to as Mountain Cedar which takes on a roundish shape. 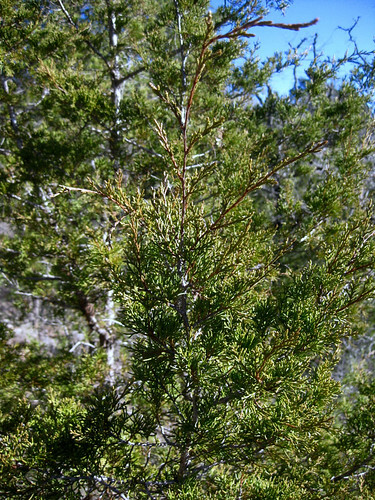 More to the east and northern parts of Texas you'll find the Red Cedar (Juniperus virginiana) which has a single trunk and grows quite tall with a pyramidal shape. The trunks of both are covered with loosely peeling, fibrous bark. The inner wood of both is reddish in color and very aromatic. When used in campfires it'll "pop" a lot and throw sparks. 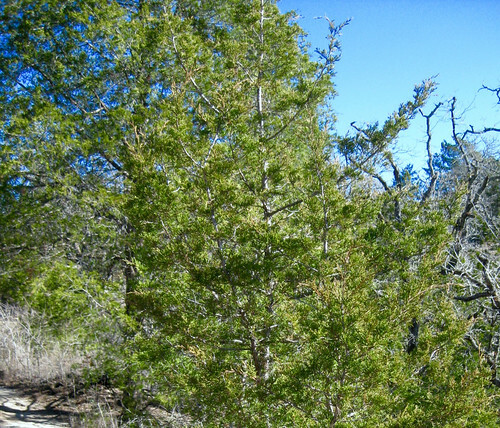 The Hill Country cedars, Juniperus ashei, can be used in multiple ways. Starting with the leaves, they can be smoked, made into tea, or used to infuse vinegar. Native Americans smoked the leaves both for pleasure and medicinally to help with lung and sinus issues/infections. Cedar tea contains the anti-viral compound known as deoxypodophyllotoxin which may be why such tea was historically used to treat many viral-based diseases. The berries, which are not true berries but rather a very strange cone like a pine cone, can be nibbled raw but they have a very potent flavor so the are best used in small quantities as a flavoring agent or seasoning. German settlers loved to ad 2-4 berries to each quart of sauerkraut. Gin alcohol is made by adding juniper/cedar berries during or after the distillation step. Soaking the berries in vodka for a few weeks creates your own version. My favorite thing to do with J. ashei is to infuse apple cider vinegar with it to make a "forager balsamic vinegar. To do this take a fresh, 16oz bottle of apple cider vinegar and pour off 1/2 cup. Now take a bunch of fresh J. ashei leaf-tips and start twisting and smashing them...not too much as you don't want lots of little pieces. Just enough so that their oils can steep into the vinegar. Now start adding these abused cedar leaf-tips into the bottle until the vinegar is just about to overflow. Cap it and set it somewhere dark for 6-8 weeks, shaking it at least once a day. After the required time has passed strain out the leaf bits through a coarse wire mesh. Don't use filter paper as you'll want the original vinegar solids to remain in the liquid. I add a sprig of cedar into the strained bottle just to mark it as infused. 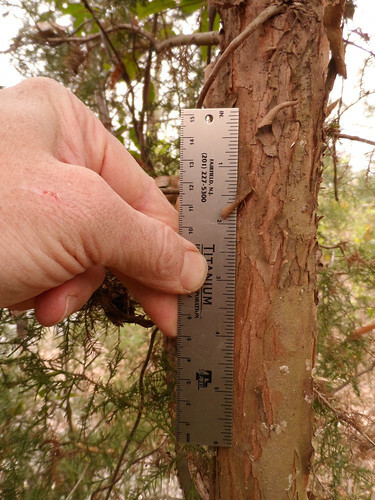 Now let's talk about Red Cedar (Juniperus virginiana). 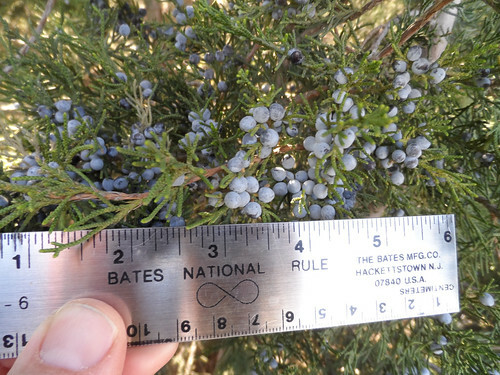 While it's berries (okay, cones) can be used the same as Junipers ashei's berries, the leaves should not be used to make tea, infused vinegars, or smoked. These leaves contain several compounds such as thujone which can cause diarrhea if consumed in large quantities. Yes, thujone is also the active ingredient in absinth, but that's none of my business. Now, that all being said, there is historical records of the Juniperus virginiana being used for tea so like so many wild edibles...who knows. I'll admit I've tried small doses of apple cider vinegar infused with both J. ashei and another with J. virginiana without suffering effects from either though of the two, J. ashei had a slightly richer flavor.